On my walk home from work, I always take a moment to look at the large billboard across from my office building. The ad changes every 10 days and almost always advertises a product or service targeting a “Nashville local.” As the target audience, I began to think about advertising and product placement, and why marketers choose the markets, channels, and placements they do when trying to reach the brand ambassadors they want. That same day, I stopped to check my mailbox and to my surprise a friend of mine sent me a book. The book was titled The 5 Love Languages: The Secret to Love that Lasts by Gary Chapman. I was thrilled because I had heard so many great things about this read and as many of my friends know, I love love—so it was a perfect fit! As I began reading my new book, I realized that we marketers use different languages to reach our intended audiences. And we always need to focus on how we want the audience to receive our message. 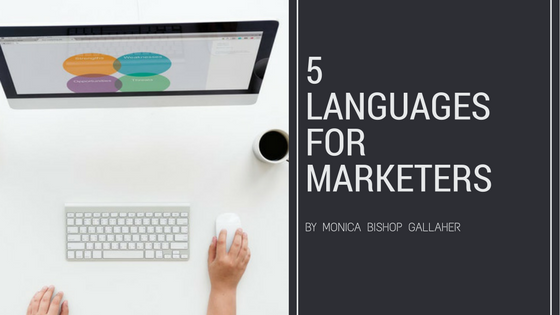 Here are 5 ways we can be sure our desired demographic is being reached using the marketing language they’ll respond to. Communicate on the platforms they spend time on. If you are trying to target a college student, your best bet is to reach them via Instagram. According to The Pew Research Center, 60 percent of Americans aged 18-29, roughly the millennial generation, use Instagram, making it the most popular social media platform among the younger generation. Whereas, if you are interested in targeting the 50+ audience—the Boomers—you may find better success via television. Baby Boomers make up the largest share of TV audiences, spending 30-40 percent more time in front of their screens than the rest of the population, according to The Economist. Build a positive reputation for the client, their product, and their brand. Mr. Schmidt drilled into us that for brands, reputation supersedes all. You can have the best product on the market, but if the public has a negative perception about you, no marketing tactic can help sell you to your consumers. To reach our desired demographic, we must first establish an impressive and trustworthy reputation. If your client is an athletic clothing brand, they must prove to their target audience that they lead in their industry, and they are knowledgeable on all issues related to health and fitness. No one is going to purchase a pair of workout pants from a brand that does not exemplify the picturesque vision of a fitness professional. That is true in any company. If Deeter Gallaher Group had no media or digital presence, and our CEO was not regularly sourced by the press, there would be no reason for potential clients to hire us. For instance, our firm was approached last week by an individual offering expertise in PR and branding for musicians. My first response was to Google him. He had no website and a weak Twitter presence. If you’re a PR professional and we can’t find you online, you have no credibility in your industry. Companies must live and breathe the mission statement they preach. Share content consumers would be proud to share and show off. One of my all-time favorite brands is MAAJI. Primarily known for their women’s swimwear and active-wear, they are a company that truly lives out their brand personality. I follow them on all social media platforms and each time they share a photo or video, I am instantly drawn to it. MAAJI calls their target market #RealMermaids: “A #RealMermaid lives in the water and the miles around it. She travels the world creating her own path. She takes pleasure in finding the uniqueness and surprises each day can bring.” Even though I live in Music City, where the closest ocean is a minimum of seven hours away, this brand shares fresh content that draws me in and makes me want to share it on Facebook, retweet on Twitter, and re-post on Instagram—I am proud to be a MAAJI #RealMermaid. To make your consumers proud to associate with you is priceless in the eyes of a marketer. Fill the need for a product or service before the target audience knows they have to have it. The purpose of an ad is to sell you something, but what good is an ad if you already have that need fulfilled? If Oreos is showcasing their mint chocolate cookies all over TV, but the Girl Scouts already delivered my Thin Mints order, I have no need for Oreos. Tell the consumer what they need, and establish a desire they didn’t even know existed. With the convergence of digital, social, traditional, and in-real-life audiences, marketing is more complicated than ever before, but it’s extremely important that companies speak the language their target audiences are fluent in. Establish stories, connect with your public, and brand champions will be built.